If you’re looking at buying a business, there are two key things you need to know: first, can you afford to buy it and, secondly, will it produce the return you want? 3. Working out what income he needs to live on, including KiwiSaver and mortgage payments. As a result, Arthur worked out that in his current situation the maximum he is able to spend on a business is $260,000, and he needs it to provide a minimum gross income of $79,120 – in addition to whatever rate of return on investment he and his accountant decide is acceptable. When we left him, he was in the position of starting to get financial information from the franchises he was interested in. What he now needs to do is look at that information and see how it compares to his financial situation. Understandably, franchisors are wary about parting with detailed financial information about their business model, so we’ll continue using a fictitious example here. Something to be aware of is that any figures provided for new franchises are only projections based upon the franchisor’s model and experience in other locations. Although an experienced franchisor should have a good knowledge of the real costs of running the business, they can’t know for sure what level of sales will be achieved in any area before that business opens. The figures provided are therefore not guarantees of performance: just a starting point for further analysis. As a potential franchisee, it’s up to Arthur to determine the assumptions on which the projections are based before placing any reliance on them. This reinforces how critical it is to seek independent assessment of the numbers from a franchise-experienced accountant who has benchmarking data based on like-for-like business performance. Of course, if Arthur looks at buying an existing franchised business, there will be specific data available for analysis (see Understanding the Numbers at www.franchise.co.nz/article/36). However, care must still be taken to ensure that the figures provided by an outgoing franchisee are realistic and accurate. 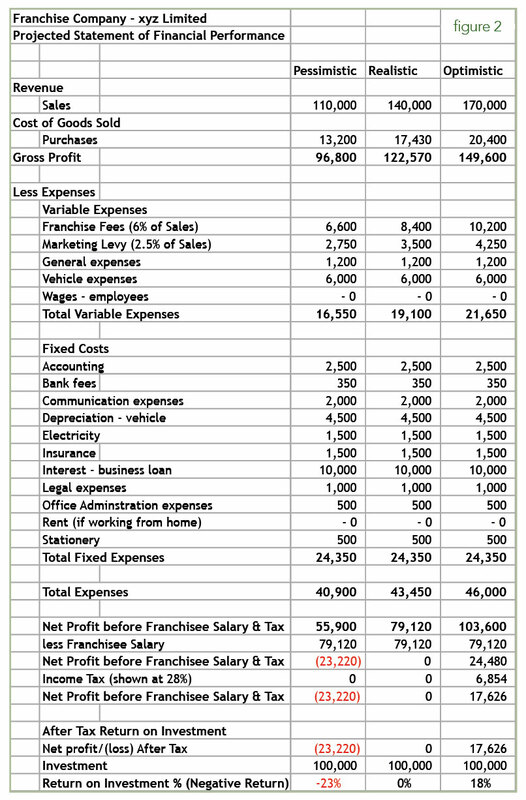 Are the projections based on actual performance of other franchisees, or are they calculated on some other basis? If they are based on actual performance of a franchisee, where was the franchisee located? Why do you believe that this experience is relevant to my planned location? If the franchisee was located in a CBD and Arthur is looking at a provincial location, both sales levels and costs – eg. rent – are likely to vary considerably. Arthur needs to be able to compare like with like. If the projections are not based on actual performance of existing franchisees, how were they determined? How realistic, given my location, is it for me to achieve the sales that you have predicted in the projections? Can I discuss these projections with an existing franchisee? What amount of working capital do I require? Is this working capital to be maintained throughout the life of the business or only in the start-up phase? Is working capital included in the quoted franchise investment, or is it additional? Do you plan to open any further outlets in my city/town/suburb? If so, how might this affect my business? Assuming that Arthur has had satisfactory answers to the above questions, Figure 1 shows an example of a projected statement of financial performance for a fictitious franchise that Arthur has become interested in. The business is within his price range, leaving him with a small margin in case it takes longer than expected to reach the point where it can pay his salary or in case of unexpected circumstances. Note that different types of businesses have different types of costs: eg. rent, staff, vehicles, etc. The above has been simplified to give an overall picture of the type of things Arthur needs to consider. It shows that in the first year of operation, if Arthur achieves the projected level of sales then he will be able to pay himself his required salary of $79,120 before tax. However, there will be no return on his investment. This is not unusual for the first year of any business – it is an establishment year, when the new franchisee is learning how to build the business, establishing a client base and starting to develop the efficiencies that will make the business truly profitable. Starting from nothing, Arthur might reasonably expect to see sales grow month-by-month during the first year, putting him in a much stronger position for the second year. That’s why he should ask the franchisor for projections covering not just the first year but the first three years – and, most importantly, for details of how other franchisees have performed in second and subsequent years. Franchises generally have fixed terms (5 or 10 years are common) and he will want to be certain that he can make a fair return on his investment during that period. Of course, if he has any sense, Arthur won’t be on his own in doing all this – he’ll be consulting with a franchise-experienced accountant who not only knows what the numbers mean but whether they are realistically achievable in his chosen industry, and even in this particular franchise. Something else Arthur’s accountant would sensibly do for him is a sensitivity analysis showing what would happen if the figures differ to any significant extent from those shown on the projection. This is a very worthwhile exercise from which Arthur can learn a lot about his proposed business. Figure 2 shows the original projected figures in the second column (Realistic); the column either side show what would happen if sales were lower than projected (Pessimistic) or better than projected (Optimistic). Neither Arthur nor his accountant can predict the future, but this format should allow them to assess this and any other franchise opportunity better. In the case of the Pessimistic projection, it shows Arthur actually making a negative return on investment in the first year, whereas the Optimistic figure shows a healthy 15%. This figure is over and above his salary, remember. Once again, it would be important to see the projections for second and subsequent years before making any decisions, and to carry out the same sensitivity analysis on them. Something else which it is worth noting in these scenarios is that while sales figures and variable expenses have been varied, fixed expenses have not. This is because established franchisors generally have a very good understanding of the costs involved in running any particular outlet and can project these with reasonable accuracy, However, if Arthur failed to manage his business properly or failed to apply the franchise system and take advice from the franchisor, he might find even fixed costs increase – reducing his return on investment accordingly. It is very important that Arthur and his accountant work through every number in each projection and work out how realistic they seem and what is the impact of any variation. However, this should be done in consultation with the franchisor. An experienced franchisor should have a good knowledge of the real costs of running the business and be able to advise accordingly; equally, a franchise-experienced accountant should know what is and isn’t reasonable in any particular franchise. For example, a non-specialist advisor might project an increase of 10 percent in variable costs ‘just in case’, which would have a disastrous effect upon projected profitability: however, if the franchisor can show that costs are carefully controlled throughout the franchise system, this would give an inaccurate impression. The review process shown above has been simplified considerably for the purposes of this article. However, it shows the elements that Arthur, with the help of his accountant, needs to consider before he is in a position to make the correct decision for his own personal circumstances. Can Arthur live with the Realistic or Pessimistic Year 1 projections if Years 2 and 3 look positive? Would he need extra working capital to see him through the first year? Are he and his family prepared to live on his minimum calculated income for a year or two as the business grows? These are all questions he needs to ask himself. Of course, Arthur may have other considerations apart from the purely financial, such as job security, the desire to move to another area, the desire to be his own boss or work with a family member. He needs to take all these into account before making his final decision. One other element that Arthur should also consider is the potential profit he might make when he eventually comes to sell the business. It’s certainly true that a good franchise brand can attract a premium over an independent business, but the price Arthur gets will depend upon the level of profit which the business is achieving at that time and the length of time the franchise agreement still has to run. That’s why he should also discuss an exit plan with his accountant even before he starts. Although the numbers and complexity differ, the above applies whether you are buying a lawnmowing business or a restaurant. To protect yourself and your family, you must first consider your own financial position, then establish the income that you require from the business and add on a return on your investment. Finally, you must carefully consider the projections for the potential opportunity. Don’t just rely on the projections given to you by a franchisor. Make sure you prepare your own projections and ensure that, if you operate it properly, the business really can offer the returns you want. Lastly, seek the advice of a specialist franchise-experienced accountant who has the experience and comparative data to help you evaluate the opportunity, review the projections and provide you with an independent opinion. You need to know before you start that your new business can deliver the results you want and that it will reward you for the effort you put into it. This article was recently published in Franchise New Zealand magazine, Year 27 Issue 4, and can be read in our digital issue or call us on 0800 FRANCHISE to request a free print copy of this issue to be posted to you at any New Zealand address. Philip Morrison is principal of Franchise Accountants, an award-winning specialist accounting practice which has worked with franchisees of over 200 different franchise brands.